Today I begin the first day of my detox journey. After a long summer vacation of traveling I’ve decided to detox. I was lucky to try out all different kinds of food this summer and still exercise but I want to do a cleanse on top of that! There are different methods of detoxing depending on how you like it. One of the most popular methods nowadays is through detox teas that come in either 12 or 28 days packages. I’ve ordered one online from Fit Tea and I’m still waiting for it to arrive so I’m going to use the more traditional method of detox, juicing. Throughout this journey I will share my recipes, and feelings with you. For the past two days I’ve cut down on processed food, diary products, fried food and sugar to be able to start my journey. It is recommended to start three days in advance but I’ve just come back from my vacation. This will hopefully help my body adjust to only juicing for the next couple of days and suppress my cravings. I will be drinking six juices a day and not eating any solid foods. 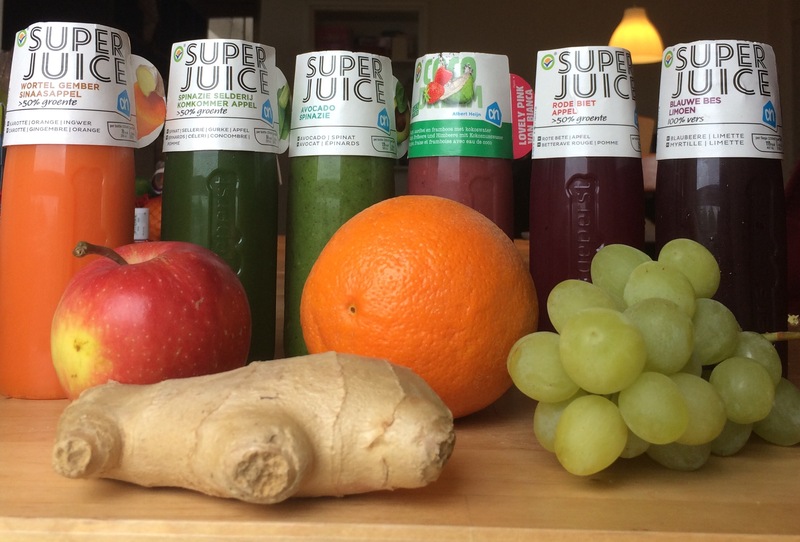 Since my new juicer from Phillips has not come in yet, I went to go to the grocery store in my neighbour called Albert Heijn and got six bottles of fresh super juice and starting tomorrow I will create my own juices that I will share with all of you. The first one is a carrot, ginger and orange juice. The second one is a spinach, celery, cucumber and apple juice. The third one is an avocado and spinach juice. The fourth is a strawberry, mango, raspberry and coconut juice . The fifth is a red beet and apple juice and the last is a blueberry and lemon juice. I began my day with a cup of lemon water juice to cleanse my body and throughout the day I will be drinking these juices in a period of two hours in between each juice until nighttime. Also to keep my body hydrated in between I will be drinking six to eight cups of water. In order to limit my carvings I’ve decided not to go out for social events that will tempt me into eating and I will limit myself to light exercise only. Looking forward to sharing my journey with all of you. And feel free to join in if you like and share your thoughts and feelings!